This New Season is proving interesting. Among the challenges is the fact that my refrigerator has a black hole. Leftovers saved with good intensions seem to be sucked into the depths of who knows where until eventually they reappear in almost unrecognizable form that cannot be saved for any purpose. My disdain of leftovers is not a new trait. When I had a leftover browser around, this was not much of a problem. They were devoured readily. Now, I have to think ahead and work on downsizing recipes. One example was yesterday’s breakfast and a planned variation of a leftover that was almost perfect! I’ll explain that after posting the recipe. I’ll be posting recipes with original serving quantities. Sometimes my narrative will explain how portions were reduced. 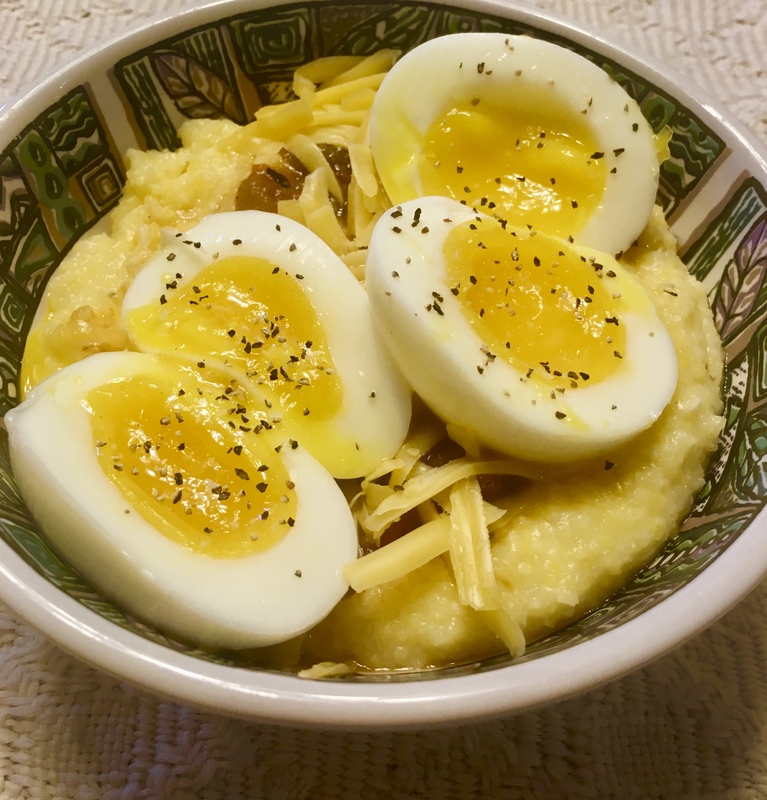 If you’ve read this blog before you have probably discovered I love green chile cheese grits with eggs for breakfast. I’ve posted many variations of my love of the runny egg yolks of poached eggs and my new love, jammy eggs with a firmer white and slightly firmer yolk. Be warned, there will likely be more. Polenta with jammy eggs and a couple of options. See below. Ground corn can be found in many colors and textures. We call a fine grind, corn meal. Depending on geography and language, coarser grinds can be called grits or polenta (in Italian). Grits can be wet as a breakfast cereal or side dish in the southern U.S. They can be an odd texture and bland taste to the uninitiated. When I first discovered grits on a road trip, I had to mix in one of those little packets of jelly to eat them. Before long, I graduated to butter and a light sprinkle of black pepper on grits. Some of my back woods family introduced me to corn meal mush – very moist grits sometimes flavored with cane syrup, sometimes with a little red-eye gravy. One morning they served fried cornmeal mush -grits that had been allowed to set a spell and firm up in a pan, then be sliced and fried in pan drippings to have a firm browned crust and tender moist center. A perfect accompaniment to eggs and sausage as long as there were biscuits for sopping the plate. In an early experience in a big city Italian restaurant several steps above the spaghetti and meat balls I knew as Italian food, I experienced polenta with a meaty marinara sauce topped with parmesan, and I don’t mean the cheese flavored sawdust in a green can. It was an epiphany . I swore off fried mush and devoted my palate to polenta and all the variations I could try or invent. El Paso is not know for Polenta. Our ground corn becomes masa and is delectable in its own right in Mexican food. Bring water and salt to a boil in a large, deep pan. Gradually stir in polenta. Reduce heat and simmer gently. Stir frequently to prevent sticking until mixture is very thick (about 30 minutes). Use a long-handled spoon because mixture bubbles and pops. It is hot if it pops on you! Taste periodically to make sure polenta has softened; add liquid if it becomes too thick. You want it to be tender and thick, not sloppy wet. Package recipe says: Stir in butter and add salt if needed. Oil a deep medium sized bowl. Spoon polenta into bowl and let set for 10 minutes. Invert onto a flat plate. Polenta will unmold and hold shape of bowl. Slice into thick slices and serve hot. Top with your favorite pasta sauce and freshly grated parmesan cheese. When adding liquid to thin polenta, I use milk or, if feeling wicked, half and half and a little extra butter for a richer taste. I like polenta and Jammy Eggs with cheese and green chile for breakfast. I thin the polenta a bit more, don’t let is set up, and, just before serving, stir in shredded cheddar cheese and chopped green chile or a good green jarred salsa, then top it with the eggs. Sometimes, I just stir in some shredded cheddar or parmesan cheese before serving. Polenta is a great and flexible base for many toppings. Remember the ratio is 3 measures of water to one measure of dry polenta so you can vary the amount you make at any given time. 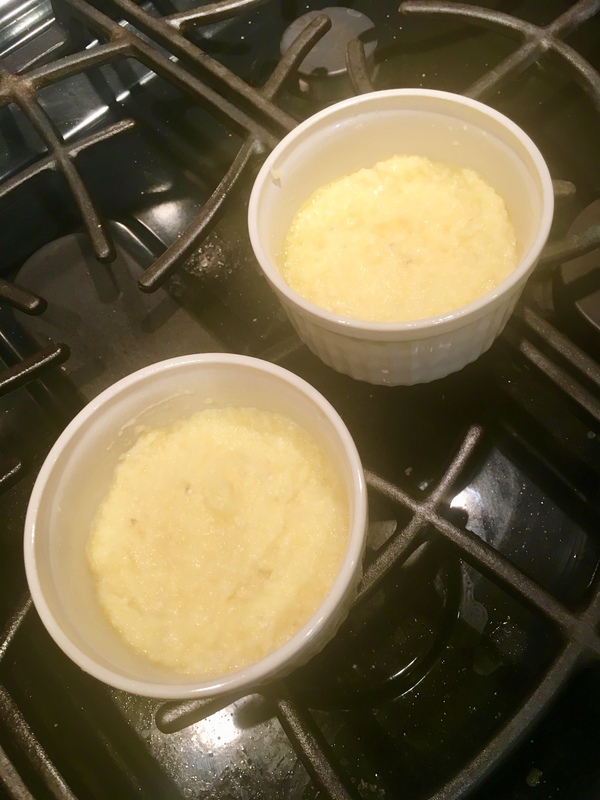 1 1/2 cups water:1/2 cup polenta makes one generous serving. In times of desperation, when I don’t have polenta in the house, I’ve been know to use plain corn meal to make a very smooth “polenta” or if a surprise guest arrives, I’ve stretched a pot of polenta by adding corn meal and extra liquid because the corn meal cooks faster. Too small roasted salmon portion with lemon, fried polenta topped with jarred tomato pesto and pan blistered grape tomatoes. On the side as spinach with mushrooms and garlic slivers. I saved the left over polenta. I put it in two oiled ramekins and topped it with plastic wrap and put it in the refrigerator until time to prep dinner. The polenta had set up very firm while I enjoyed breakfast. I added a little water to thin it out so I could spoon it into a pair of ramekins. I covered it with plastic wrap and put it in the fridge until time to prep dinner. MISTAE! MISTAKE! MISTAKE! I should have left it out to set up again and I should not have put plastic wrap on it. This was polenta, not a custard that might develop a skin without the plastic wrap. I coddled the “not quite set” polenta into an oiled pan and began cooking it over medium heat. It was taking a long time to dry out and I kept having to reshape it as it cooked. I finally was able to flip it over and work on the other side. It browned somewhat and I was able to top it with the jarred sun dried tomato pesto, my pan blistered grape tomatoes and a sprinkle of grated parmesan. I transferred the patties to my plate and moved forward with plating the spinach and salmon. I seasoned the salmon with a little olive oil, salt and pepper and lemon slices. The store portion was more narrow than the lemon slices, so I had to manipulate them to fit. No gripes about the greens and mushrooms. I did add a light sprinkle of Fred’s Red Hot Sauce. That’s what we southerners do with our greens! On the New Season adventure, I’ve decided it is better to pick up a serving a greens at a salad bar than to buy a large bag or tub of greens that won’t be used up. Better economics in the long haul. I choose a small jar of tomato pesto that I can finish over a larger jar of pasta sauce that would be destined for the black hole in the fridge. 3:8 A time to love, and a time to hate; a time of war. And a time of peace. I have always been taken by these Bible verses and found peace and comfort in them during times of stress and hurt. I hope to find recordings of the versions of the verses turned in to song by Pete Seeger in 1952 and by the Byrds in 1965. It may seem odd that I am sharing these verses here. I do so to introduce a new recipe category in the Gringo Gourmet blog. It is called “A New Season”. It will consist of recipes pared down to one or two servings and new creations in smaller portions. There will still be entries in the other recipe categories. I do hope readers will comment on the new category and the narratives that will accompany them. This new approach is one way I am adjusting to the death, May 23, of my beloved best friend and partner, Jack Gibbs Makepeace, Jr. following a very rapid 11 day course after diagnosis of pancreatic cancer. His family and I were with him and are thankful that we could be there for him. We now are now beginning a new season in our lives. Don’t give up cooking and enjoying good food. It can be therapeutic. Find a recipe that divides evenly. This recipe was for four servings of three scallops each. I was too embarrassed to ask for three scallops, so I asked for six. I’m very glad I did. Use what needs to be used from the fridge or freezer and find a recipe that works for it. I had a small fillet from Omaha Steak that needed to be used, so I suddenly had a new twist on Surf ‘n’ Turf. If you have to buy expensive fresh herbs for a recipe, find another recipe that helps you use the rest of the herb. Use the right shortcut tools. I didn’t want to bother cleaning a blender, so I used a small electric food chopper. It is very good at chopping, but not so good at puréeing. Maybe the immersion stick blender instead next time. All are doable, it just takes a little thinking and planning. The base of puréed peas, lemon and mint was delicious; the topping of whole peas and bacon was attractive and good. The chunky purée base took away from the accent o the whole peas. I had to have lemon juice and grated zest for the purée so I cut a few strips of lemon peel for garnish before grating. I plated the scallops with the lemon zest strips and some tiny mint leaves. It was 106º the evening I made this, so my little steak was pan broiled in the kitchen instead of out on the grill. Below is the original recipe for four. Buy more scallops if you are cooking for four, three each just wouldn’t be enough. Place scallops on a paper towel lined plate and pat very dry with additional paper towels. Season both sides with 1/4 tsp salt and 1/4 tsp pepper total. Bring 1 cup water to a boil in a small pot, covered. Add peas and 1/2 tsp. salt; cook until peas are bright green and tender, about two minutes for fresh and 4 minutes for frozen. Drain peas through a strainer set over a small bowl and reserve cooking liquid. Add bacon to a large skillet and heat over medium-high. Cook bacon, stirring occasionally, until fat starts to render, about 3 minutes. Add shallot and cook, stirring, until softened and lightly browned and bacon is crisp, about three minutes more. Using a slotted spoon, transfer bacon and shallot to a small bowl, reserving fat in skillet. Add 1/2 cup cooked peas to bacon mixture. Purée lemon juice, 1/8 tsp salt an 1/8 tsp pepper, the remaining 1 1/2 cups peas and 1/2 cup reserved pea cooking liquid in a blender. Add oil and purée until smooth. Add 2 Tbsp mint leaves and purée until just combined, but pieces of int are still visible. Divide pea purée among 4 plates. Heat skillet with reserved fat over high until just barely smoking. Working in batches and adding more oil if needed, sear scallops until a golden brown cut has formed and scallop releases from skillet, about 3 minutes per side. 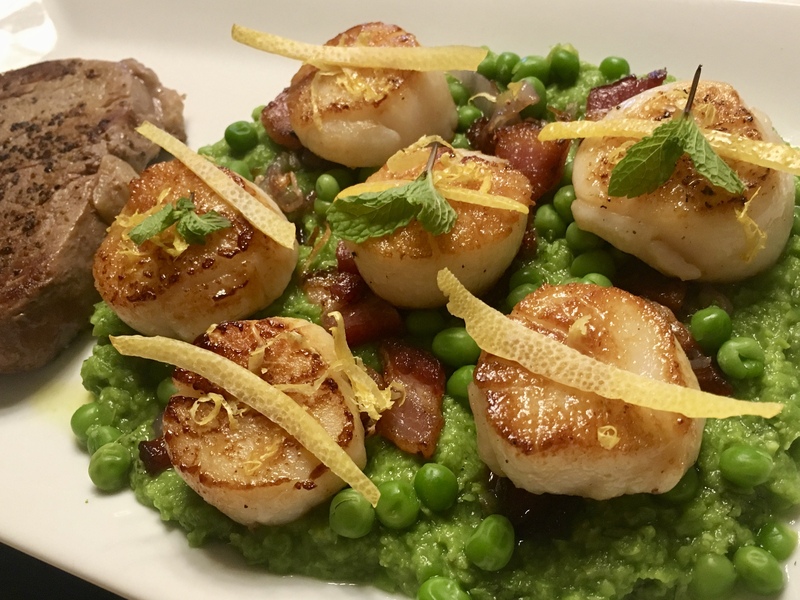 Top pea purée with scallops and bacon- pea mixture, then sprinkle with remaining 1Tbsp of mint.